How do you explain to your children not to take something that is not theirs? It appears not to be part of some peoples education. Please be careful what you pin. How can we make someone who violates copyright that their actions are not without consequence? Does it give you pleasure to know you have made a world famous designer cry today? That you have taken her artistic abilities & reduced them to nothing by stealing her images and designs, to give them out for free to anyone who wants it, so that the design is no longer marketable? That the design she has spent hours, weeks or even months to design is being distributed by people who have no respect for her talent, whilst congratulating themselves on their “skill” in reproducing that design? Thousands of hours are spent trying to protect our designers Intellectual Property. Only THEY have the right to decide how that design should be distributed. Not you – someone who has probably downloaded software illegally to copy the designs, not you – someone who thinks nothing of the work, time, money & effort that has gone into the production of a design, not you – who considers herself talented because she has COPIED someone elses artwork. Is this how you bring up your children, that taking something that does not belong you is fun? To have them in the playground saying “granny* is a thief” (*Mummy, Daddy, Granny, Grandpa). Do you teach them to go into shops and take things off the shelf, put them in their pockets and walk away without paying? And justify your behaviour because the person in the aisle next to you did so? When a designer and their assistants have to spend hours policing websites, that designer cannot concentrate on her creativity. Honest fans are insulted and upset to know their favourite designer is treated in such a disrespectful manner. An honest stitcher who has bought a chart or kit legally can hold her head high and stitch that design with pleasure & pride. Designers have to spend many hours reporting violations on websites who make it extremely difficult, if not impossible, to have illegal copies of their work removed. Does it give you pleasure to know you are contributing to the destruction of the needlework industry? Designers are forced out of designing as they can no longer pay their bills. They have to get a “real job”. The world is losing these talented peoples contribution to the needlework industry. Magazines, publishers, shops are closing. Support your designers. Buy designs legally so that we can carry on designing without the continual burden of theft. How do you understand the mindset of thieves? 2 Dutch women have been violating needlework designs for years, despite numerous legal warnings. 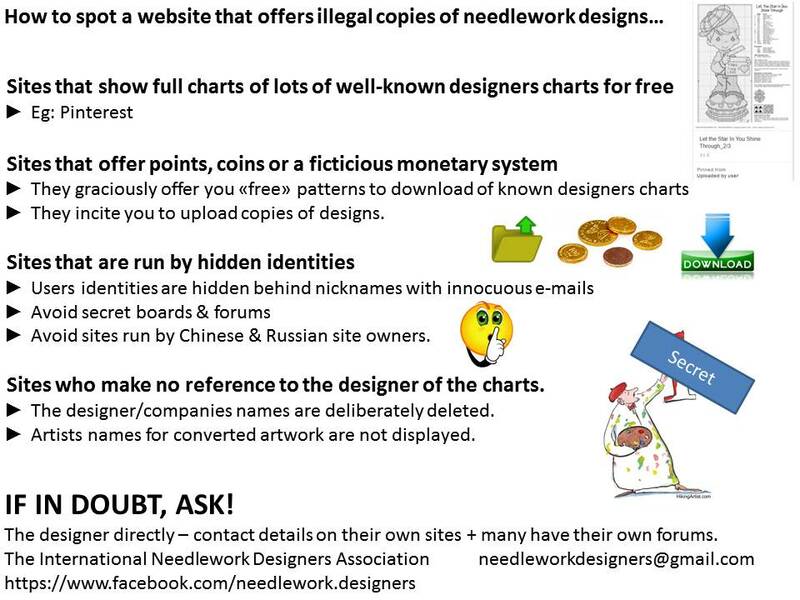 Diana Wiersma & Desiree Onnekink Griffioen run a club in which they continually distribute illegal copies of needlework designs. Dees also assists in running a notorious Chinese site. 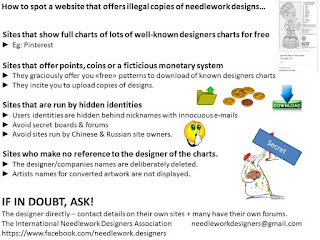 Having reported illegal copies for removal for the umpteenth time, which continually takes up huge resources from our operatives, causing enormous distress to the designers concerned without even going into the financial losses caused by such nauseating behaviour, here are a few snippets from their latest conversation which shows the mindset of these women who are incapable of understanding that they are THIEVES. Thanking themselves for “sharing” thousands of illegal copies, upset that their “work” should be undermined and trying to decide how to set up a new club to continue their activities. Yes, Diana & Dees, Big Brother is watching you … it’s a shame you can’t find something legal to do instead of stealing from others. We do not believe such specimens should be allowed the honour of sewing our designs, nor to participate in designers groups. … Meanwhile, the second sleepless night .... and we are not yet out how to proceed. The club still exists, as you see, but ..... there is nothing more. I have all the "content" as the club master calls it removed. In other words .... every "movement" that I make on clubs, is followed closely. That feels very nasty .... "Big brother is watching me" ... it does not feel safe anymore, as if my freedom is taken away. I have consulted with Desiree and we are not giving up yet. I am in any case completely gutted, feel helpless and sad, because yes .... this club is really my passion and my life. So we are still some time to find a solution ..... so today as no weekend pictures. In any case, I want to thank everyone who through club mail, mail, or here in the forum has given a helping hand, it does really well and really makes us feel that our "work" is really appreciated. THANKS all !! !